Ukulele at Lamp House Music has proved very popular – and it’s easy to see why! This fun and sociable class is for all ages and currently run on Tuesdays by an enthusiastic and experienced Lamp House Music tutor. Our ukulele classes are small groups of up to 8 people, with a wide range of ages and abilities in attendance! Each week students will learn and develop different tunes (more confident members can sing) and this will enhance skills in teamwork and solo performance. Pupils participate in the choice of material to learn each term and there will be opportunity for pupils to try percussion to enhance the sound. Perfect to learn as an instrument in it’s own right or as a stepping stone to other musical ambitions, this fun, informal class will be the highlight of your week! 6.30-7.15pm Ukulele – Beginners – NEW pupils welcome! Come along and join in the fun, for complete beginners, adult and young people, ages 12-112! 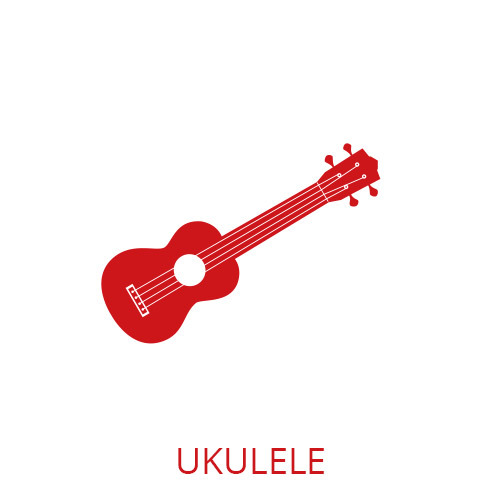 Throughout this term you will learn numerous chords on your ukulele, so that by the end of this short term, you’ll be able to play a couple of songs! Come to the first class with suggestions of a song that you would like to learn, your tutor will tailor the lessons to the tastes of the class and teach pupils’ requests throughout. £12 per lesson, payable in advance in small blocks. 7.15-8.00pm Ukulele Post-Beginners – NEW pupils welcome! For adults and young people with some experience of playing ukulele. For both Ukulele Classes you are welcome to come along and pay for one lesson to see if you enjoy it (we are sure you will!) after which we ask that you commit to the term. Full information will be sent upon enquiry. Ukulele is a great first instrument, just four strings, small and manageable. Ukulele is now commonly used in schools (including across East Lothian!) as an introduction to playing music. These classes are ideal for beginners and are the perfect stepping stone for children who have expressed an interest in learning a stringed instrument. These classes are a fun introduction to the ukulele just for children. 30/45 minutes (depending on age of child). £10/12 per week. Ukulele Kids 1 – ideal for ages 7+ years. £10 per week. Ukulele Kids 2 – specifically for younger children, ages 5-6 years. £10 per week. Ukulele Kids 3 – for children ages 6+ years. £10 per week.